From 2007-2013, the share of jobs in the Rochester metro area performed by those aged 22-34 increased from 24.7% to 26.5%. That was one of the largest jumps in the country. 2014 estimates show that roughly 28% of Monroe County's residents are millennials, outnumbering baby boomers who account for 26%. If, just if, employment and entrepreneurial options can grow, Rochester will have amazing access to a surprising youth movement. By 2016, downtown's population is anticipated to be 7,873. If this rate of growth of 143% every 16 years were to continue (a big if, I know), downtown Rochester would have almost 19,000 residents by 2032. That number is remarkably close to the Brookings Institution's 2 percent solution for creating a healthy and vital city. As of 2011, a study of the 100 largest American cities showed that 9.45% of the jobs in the city of Rochester were arts-related. That was the highest percentage in the country. Another way of looking at the above is that there were 60.78 arts-related jobs in Rochester per 1,000 city residents. That was, of course, the most of any city, with #2 being Atlanta at 41.55 arts-related jobs per 1,000 city residents. Despite at the time being the 98th largest city by population, only 19 other cities had more total arts-related jobs. WITR (89.7 FM) is broadcast from the Rochester Institute of Technology. Offering a unique mix of indie, alternative, and specialty music, WITR is considered one of the best college radio stations in the country. WGMC (90.1 FM), or Jazz 90.1, is listener supported and broadcast from a high school in the Rochester suburb of Greece. In addition to providing programs in Lithuanian, German, and Spanish, Jazz 90.1 is one of perhaps 55 stations nationwide dedicated to jazz. WBER (90.5 FM) is a local, independent, and commercial-free radio station that derives support from listeners and local school districts. With an eclectic mix of music which can generally be defined as alternative, WBER serves as a much needed antidote to the mindless babble otherwise available on a morning commute. It has been recognized (at least by some random guy) as one of the 40 Best Little Radio Stations in the country. WEPL (97.1 FM) doesn't exist yet, but it illustrates an important point about Rochester. Upstate New York is often unfairly labelled as homogeneous. 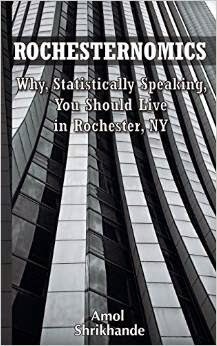 In Rochester's case, the label is particularly unjust and generally inaccurate. WEPL will be a 24-hour Spanish radio station catering to Rochester's Spanish speaking community which is the largest in New York State outside New York City. Only six franchises in the history of North American professional sports have been playing in the same city and the same league uninterrupted since the 19th century: the Chicago Cubs, Cincinnati Reds, Philadelphia Phillies, Pittsburgh Pirates, St. Louis Cardinals, and Rochester Red Wings. Red Wings alumni include Bob Gibson, Stan Musial, and Cal Ripken, Jr.
Frontier Field, home of the Red Wings, was recently ranked as the third best minor league ballpark in the country. Among over 200 communities, Rochester is considered a top 20 minor league market and at times has ranked as high as number two.